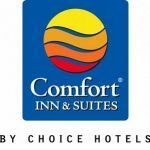 The Comfort Inn & Suites Near Burke Mountain is located off of exit 20 on Interstate I-91 in beautiful St. Johnsbury, Vermont. Our Comfort Inn & Suites has been awarded #1 Comfort Inn worldwide, several Gold Hospitality awards by Choice Hotels and the Trip Advisor Award of Excellence! Our property offers 107 well-appointed, oversized guestrooms and suites that are 100% non-smoking. Our traditional guestrooms offer one king bed or two queen beds with a spacious living area and pull-out sofa bed! All of our guestrooms and suites offer: in-room microwave and refrigerators, coffee-makers, flat-screen TVs, hairdryers, irons, free Wi-Fi and more! We also offer pet-friendly rooms, so bring along your furry friend-they’ll love Stephen Huneck’s Dog Mountain! Your stay with us also includes: our complimentary deluxe hot breakfast buffet including make-your-own Belgium waffles with real VT maple syrup, use of our indoor heated saltwater pool, whirlpool, sauna, fitness center, arcade room, business center, guest laundry and more. Ask us about our family fun packages for: Kingdom Trails, Burke Mountain, Jay Peak and many more!